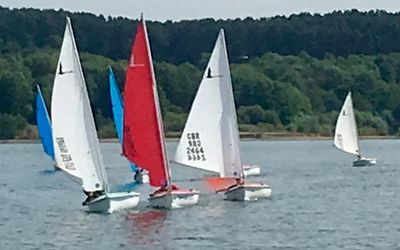 Despite rapidly falling water levels, and jetty space at a premium, our dedicated Sailability team is winning a way through to ensuring our wheelchair using sailors continue to enjoy their days on Carsington Water. The brilliantly versatile Sierra is performing a vital function in ferrying sailors and wheelchairs out to the floating jetty, where you will have noticed we have installed one of the hoists. By dropping the bows of Sierra onto the slipway, steering the chairs aboard, heading out towards the dam, and then by docking against the floating pontoon, we’ve conceived a safe way to continue sailing. The north jetty is not safe for non-ambulant sailors and unfit for transfers by hoist, but our dedicated sailors want to continue sailing to the end of the year. It’s time consuming and needs an additional support, but our sailors can now transfer from Sierra, onto the floating pontoon and then transfer again into the Hansa 303s or the Venture Keel, and into the main sailing area. We’re hoping for another successful bid. Following on from our successful bid for a grant to automate the main entrance doors, we have a small team working on an outline bid to replace a jetty and provide better access for all. You will remember that the three excellent wide and stable concrete jetty sections came to the club through Sailability bids. If low water continues into coming seasons, this is exactly the proactive thinking and planning that is needed. We’re excited to share the great news that the annual Sailability Summer Splash and Well Child Family Day is nominated for inclusivity award. Over 70 families arrived for a fantastic day of fun and water activities in July. The real heroes of the day were the children themselves, and their dedicated families. By mid-November we will know the outcome. 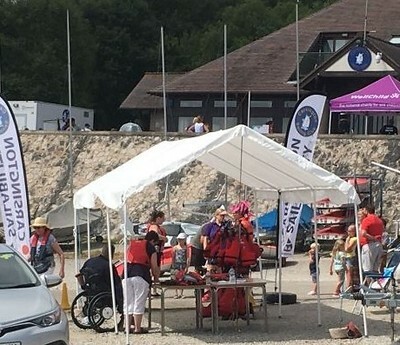 And of course, thanks again to our dedicated volunteers and club members who turn out Wednesdays and (increasingly) on Saturdays to support our sailors with disabilities. Don’t be shy of contacting us if you’d like to join our volunteer team - the more we are the greater the benefits. Training and support for all volunteers. Keith Stubbs - club member and Sailability volunteer. Just thought I would put down a few words as regards my recent trip to Spain sailing. 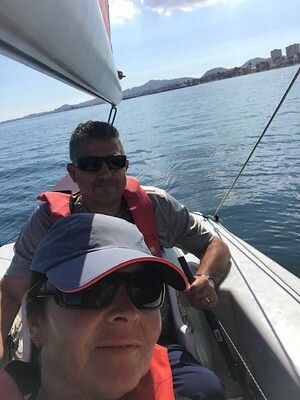 I had heard of a guy that ran disabled sailing on the Mar Menor in Murcia in Spain and thought I would love to give it ago. Basically, I contacted him, explained I was in a wheelchair and would it be ok to go. He said yes and we made subsequent arrangements. We stayed a week and sailed five days. I can honestly say it was something I will never forget. It was brilliant. The guy that runs it is also in a wheelchair and a really good sailor. He is also a true character and one of the most inspirational people I have ever come across. The first day was memorable and hilarious. When we arrived, I explained I needed a hoist to get in the boat, to which he said we have got that covered and then two men physically lifted me from my chair into the boat. I am glad the diet has partially worked. We sailed a boat called a “Woody”. This is a dinghy based on a Martins 16 which has been stripped down and made fully accessible. The seating position is one behind the other as opposed to side by side. With rear being the helm and front seat sail setting, although you can adjust for single handed if needed. It was great to learn new skills and get experience of using the spinnaker. 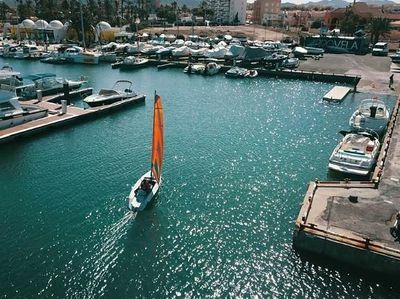 Before we left the Marina, I asked any advice on a preferred course to which he simply said “There is the Med go and have fun, don’t worry we will watch you and you have your phone if you need us”. We were followed on the first day by a power boat that remained about 200 yards from us then the remainder of the time we were on our own but the sea was behaving, although one day we did have 2-3ft waves which made the boat bounce a bit. We averaged about 4 hours per day on the water, the longest about 6 hours but I did manage to sail around two islands that day and navigate past numerous fishing nets that suddenly appeared.